Every year on October 4th it’s Kanelbullens dag in Sweden. 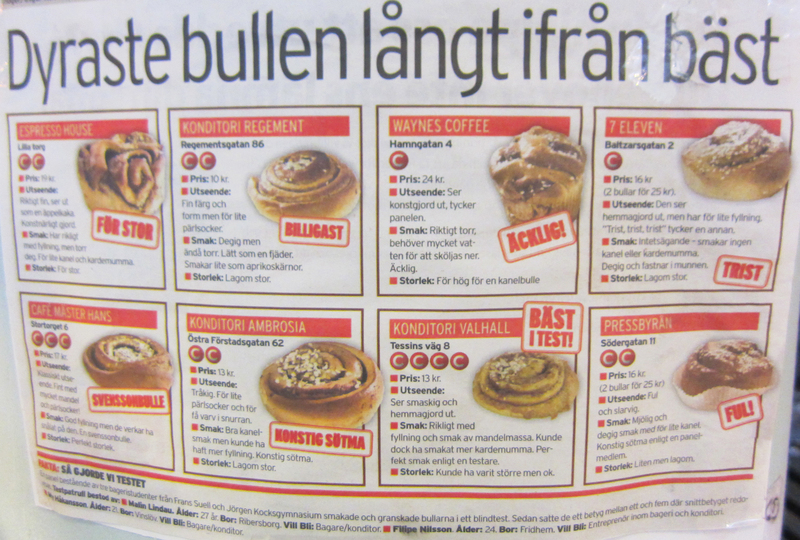 Time to break out the flour, yeast, and cinnamon, or buy kanelbullar (KUH-neel-BOO-lahr) at your favorite bakery. They are so entrenched in Swedish culture that you will even find them in gas station quick marts and in “convenient” little bags to go. 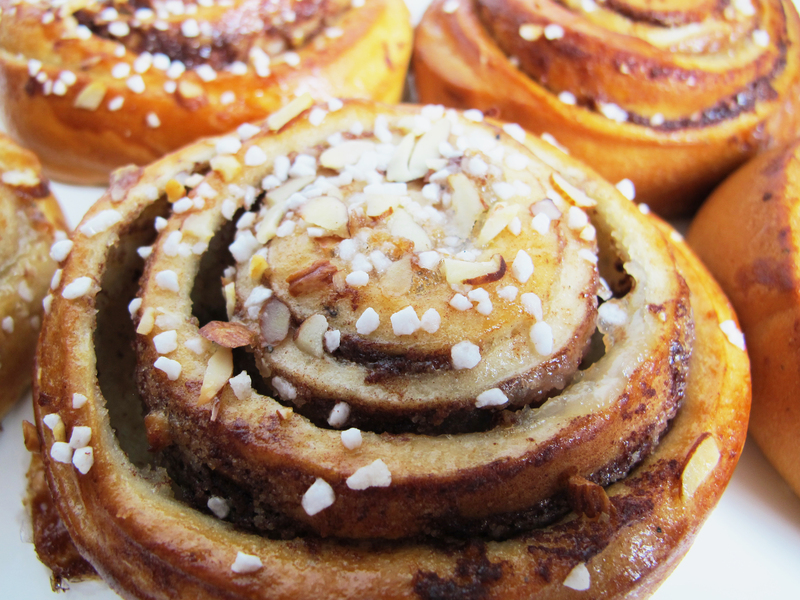 But unlike in the U.S., a Swedish cinnamon bun won’t be dripping with sticky-sweet icing. Back in 1999 hembakningsrådet (the home baking society) established kanelbullens dag to celebrate the well-loved Swedish classic along with their organization’s 40th anniversary. 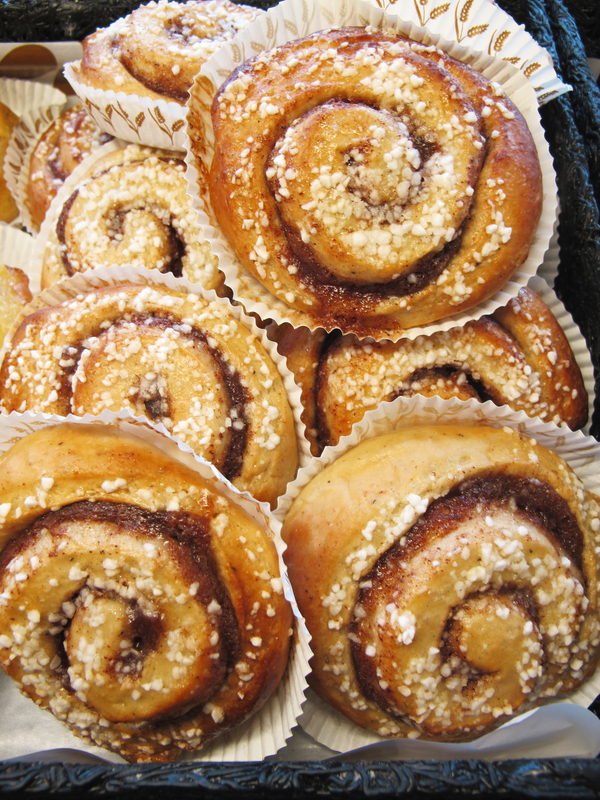 October 4th was chosen because fall marks the beginning of the high season for Swedish home baking. 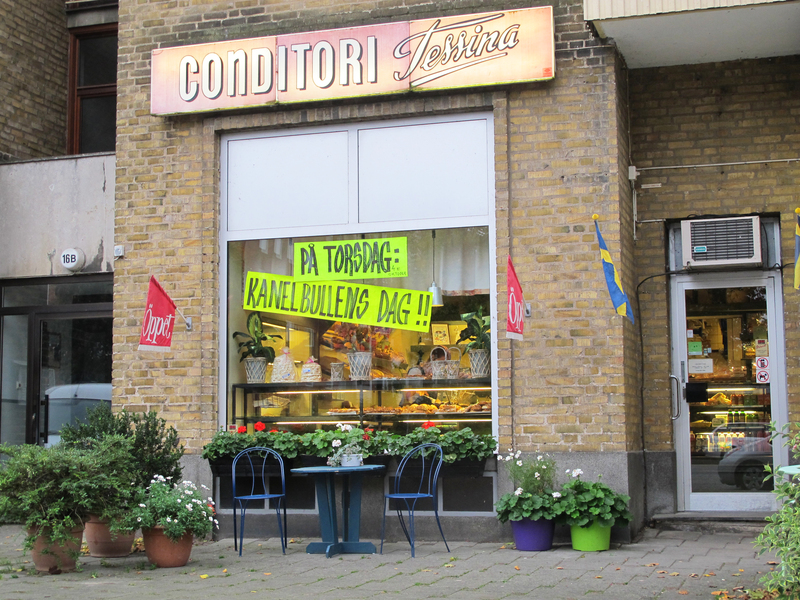 Their mission of hembakningsrådet is to inspire people to bake with the help of reliable recipes and practical advice. You can find many recipes on their website as well as email them questions about tips, recipes, and even history. They actually helped me to crack the mystery of Prinsesstårta and why it is green by referencing their historic editions of the Prinsessornas Kokboks. 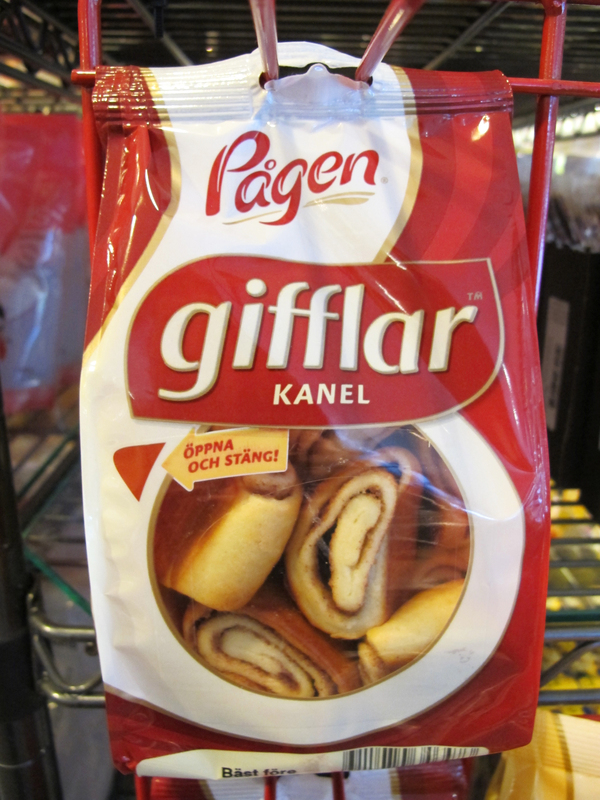 According to the information on hembakningsrådet’s site, kanelbullar were a popular bakery item in the 1920s but didn’t become commonplace baked goods in Swedish homes until the 1950s. During the 19th century, ingredients like white flour, sugar, cinnamon, butter, eggs, and almonds were precious items and the enjoyment of fine wheat buns was generally reserved for the wealthy or only enjoyed on very special occassions. By the end of the 1800s, Sweden was producing its own beet sugar and over time domestic situations improved for the masses with many previously revered ingredients becoming more commonplace. 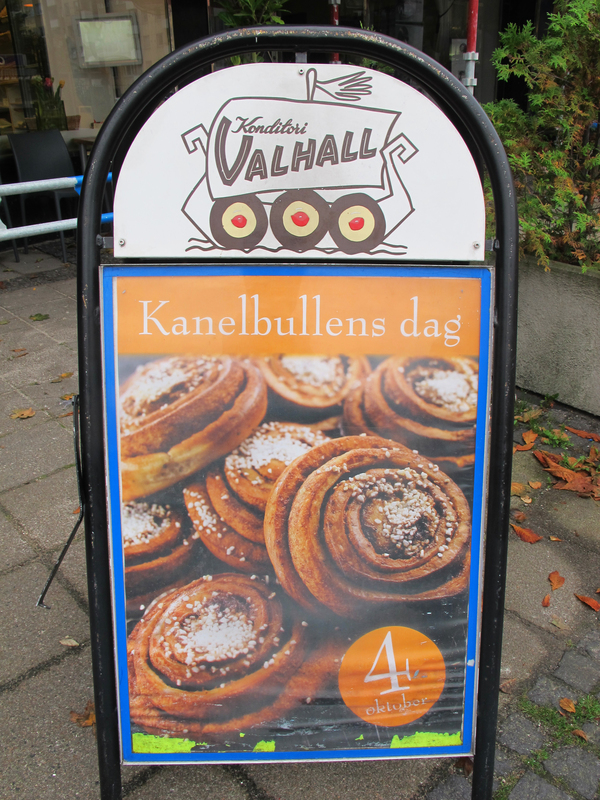 Today kanelbullar are the most popular Swedish baked good, perhaps because they are essentially a comfort food and have a strong connection to childhood memories for many, or just because a good kanelbullar is, well,……sooooooo good. Unlike the icing-laden sticky buns of the U.S., Swedish cinnamon buns are most often sprinkled with pearl sugar that adds a nice crunch. You can also find them with slivered almonds on the top. The typical form is a sprial and there are definite opinions on whether you should bite through the spirals of the kanelbulle, or unwind it. 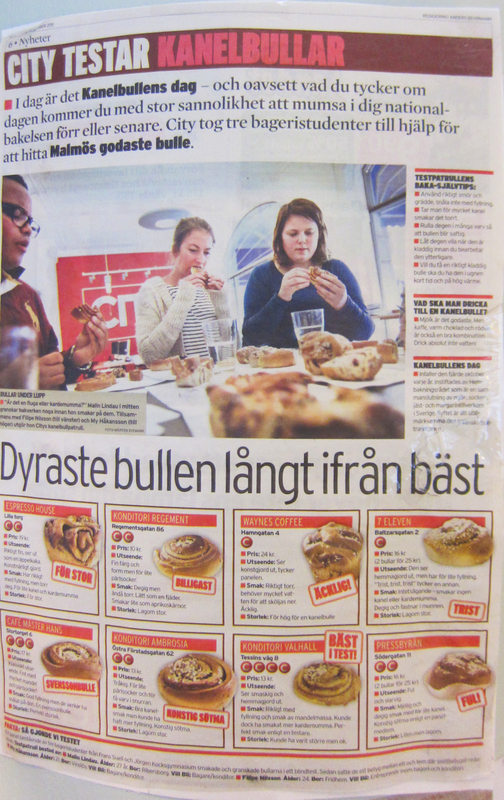 To mark the day, there are reviews in the paper for the best kanelbullar, and a definitive spike in kanelbullar bakery sales. The buns people make at home tend to be a size you could cup in the palm of your hand as opposed to those from a bakery which are generally larger and would cover your entire palm. I can’t begin to pretend that I baked any of the kanelbullar picutred here. I am not much of a baker and time did not allow for it this week. But I am including a translation of the kanelbullar recipe from Vår Kok Bok which is an incredibly reliable source and essentially the ground recipe for the lussekatter I made last Christmas. So if you are a baker, it’s your day to shine. 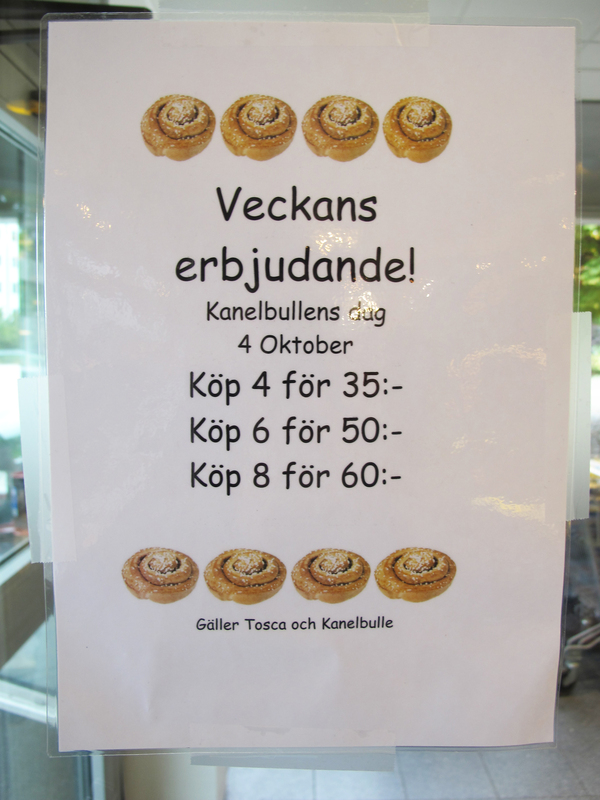 Otherwise, go out an buy a cinnamon bun to celebrate kanelbullar dag. It doesn’t matter if it’s the Swedish version or oozing with icing. Simply embrace the opportunity to partake of one of the world’s oldest spices in a relatively modern tradition that is worth celebrating, just for the fun of it. 1. Melt the butter in a saucepan over medium heat. Add the milk and heat until just warm to the touch or 98°F (37°C). 2. Crumble the yeast into the bowl of your mixer. Pour in the butter and milk mixture and stir until the yeast is dissolved. Add the salt, sugar, and most of the flour. Work the dough until it is sticky, but doesn’t stick to your hands. Use the minimum amount of flour possible to achieve this. Let the dough rise in a lightly oiled bowl covered with a kitchen towel until doubled in size, about 30 minutes. 3. Place the dough on a lightly floured surface and knead until the dough is smooth adding flour as needed if the dough is too sticky. Divide the dough into two equal portions. Roll one portion of the dough into a rectangular shape about 8″ x 24″ (20 x 60cm). Spread half of the softened butter over the dough and sprinkle with half of the sugar and cinnamon. Roll it gently from the long side, not too tightly. Repeat with the other portion of dough. Cut each roll of dough into about 24 pieces. Place each piece cut-side up in a baking form or on buttered parchment paper. If using parchment, ensure that the “tail” of the bun is tucked under so the roll doesn’t come undone during rising and baking. Let rise, covered with a kitchen towel, 30 minutes. 4. Preheat the oven to 475°F (250°C). 5. Beat the egg in a small bowl and brush it over the tops of the buns. Sprinkle them with pearl sugar and slivered almonds if using. Bake the buns in the center of the oven for 5-8 minutes. When they are browned and sound hollow when tapped they are finished. Let them cool under a kitchen towel. The buns dry out quickly so once they have cooled to room temperature place them in an airtight container. If they do dry out too much, you can wrap them in a damp kitchen towel and heat in the microwave for a few seconds. Keep an eye on the towel so it doesn’t catch on fire. The buns also freeze really well so you can enjoy them for a longer period of time. **For the filling you can swap out the cinnamon with vanilla sugar or blend 1 teaspoon of vanilla into the softened butter. Sounds like a great thing to do for Breakfast on Sunday. We’ll make and take some to Mom and Dad 🙂 Since I just happen to have some of the pearl sugar that my dear Sister gave to me. Hi Milena. Thanks for the nice comments. Best wishes with your blog, and yes, you are welcome to share the photos and site links with appropriate mention.